This hole, which looks like the aftermath of an attack by either Godzilla or Jehovah, was actually caused by economics. In 2007, it was meant to be a foundation for the tallest tower in the Western Hemisphere. It’s 76 feet deep and 110 feet wide, and it was going to put up over a thousand homes right in the center of Chicago. However, after 2007 came 2008, the end of the housing boom, and a huge economic downturn. The property market is resilient, though, and in 2014, the developer, Shelbourne, raised people’s hopes with the idea that the spire could once again go forward. Sadly, the only thing that came of it was the transfer of the deed to the land to Related Midwest. Streeterville, the neighborhood in which this literal depression is placed, is right in the center of Chicago. It’s next to the Navy Pier, a pier extending into Lake Michigan that was once a shipping location but is now a kind of permanent fairground—and a popular spot for tourists and locals. The neighborhood is a good one, and none of its residents enjoyed looking at a metaphoric hell-pit. Passers-by might have taken the construction crews that started showing up in the last week as a good sign. Sadly, they weren’t there to build a tower. They were there to build hills around the hole. These small hills will be covered with trees which will hide the giant hole from view, at least from ground level. 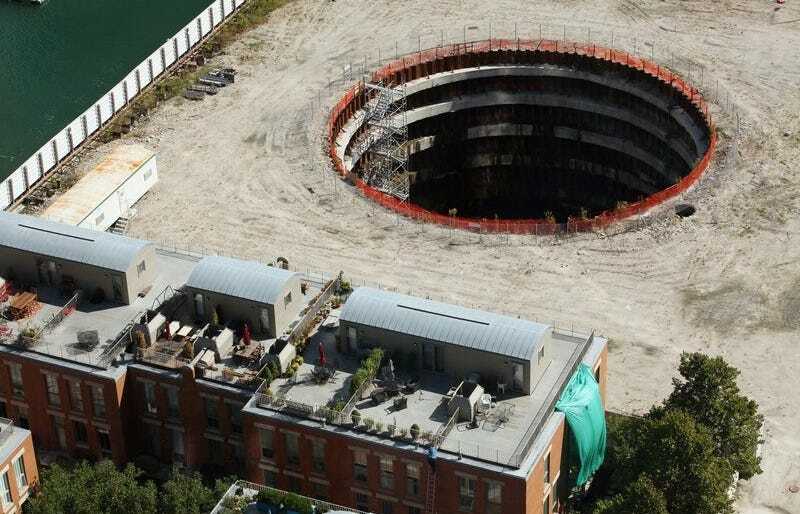 It appears, though, that people have temporarily given up on the idea of a new tower in Chicago, and accepted the hole as a semi-permanent part of the neighborhood.